Hungarian Prime Minister says his country does not see itself moving its embassy to Jerusalem in the foreseeable future. Hungarian Prime Minister Viktor Orban said Monday that his country does not see itself moving its embassy from Tel Aviv to Jerusalem in the foreseeable future. Orban said he does not intend to take a similar step to the one taken by U.S. President Donald Trump, who last week recognized Jerusalem as the capital of Israel. "Hungary has no reason to change the policy it has taken so far in the Middle East. 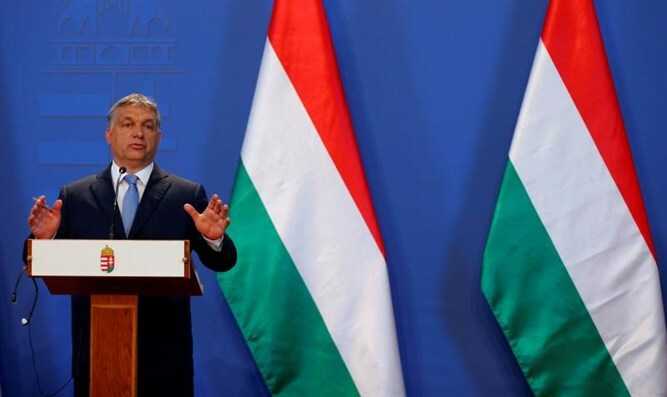 The possibility of moving the embassy or recognition of the Israeli capital has not been discussed at this time," said the Hungarian leader. Both Hungary and the Czech Republic, which said it recognized western Jerusalem as Israel’s capital following Trump’s declaration, prevented the EU foreign ministers from publishing a statement condemning the American recognition of Jerusalem. While the major European countries wished to condemn Trump’s move, in order to issue such a statement, unanimous agreement is required. Orban led the opposition to the move and the Czech Republic joined the move. Ultimately, due to the opposition by Hungary and the Czech Republic, EU foreign minister Federica Mogherni was forced to issue a condemnation in her name only. Zeman on Saturday accused EU states of being "cowards" in their response to Trump’s recognition of Jerusalem as Israel's capital. "The European Union, cowards, are doing all they can so a pro-Palestinian terrorist movement can have supremacy over a pro-Israeli movement," said Zeman.